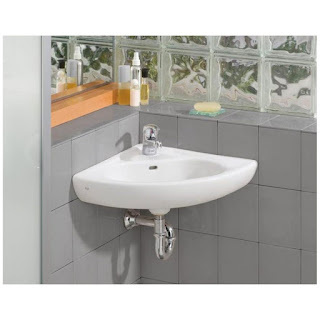 There are a variety of sink choices for a small bathroom. One particularly good option is a corner sink. 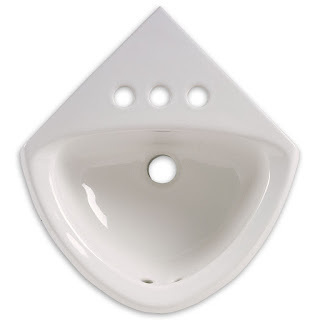 Corner sinks are perfect for small or unusually shaped bathrooms because they require very little space. Here are several that our customers recommended. This Elizabethan’s Classics Corner Sink with a chrome Kohler Faucet, for example, is very small and discreet, yet highly recommended by our customers. "Andrew1000" from Boston, MA describes it as “a perfect size and completely out of the way”. Take a look at the photo he submitted below. If you're looking for a sink with a more interesting shape, this corner basin sink may be a good choice. Due to the size and shape, it can be installed “in tight [spaces and allows] doors to open without hitting the sink”, says "DLB1" from Washington, DC.